Calicut Heritage writes about Tipu’s antics in Calicut from the diaries of Francois Fidele Ripaud de Montaudevert who was part of Tipu’s army that went into Kerala. 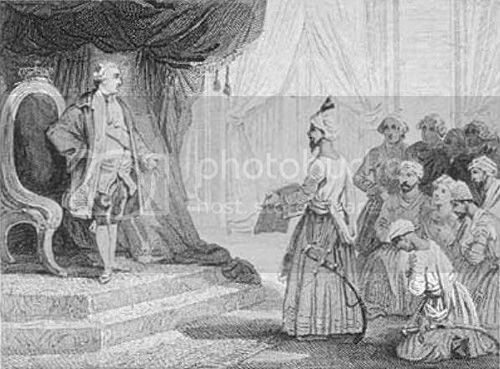 A lot of historians have explained that most of the anti-Tipu narratives come from his enemies, the British, and cannot be trusted. So it is interesting to read what one of his allies had to write. On one side this led to the British conjuring up an international Jacobin plot, touching the distant tip of South India while on the other side Tipu was now determined to obtain the required support from France through the isle of France and prepares a new Secret embassy of two or three persons to sail to Mauritius with Ripaud. This is of course downplayed by various writers taking the ‘Tipu is a martyr’ line – Some leave out this entire Ripuad chapter from their accounts of the glorious Tipu, in fact one even goes on to say that Tipu actually sent his emissary to obtain artisans from Mauritius! Well that was a tall tale, in my opinion, taller than that narrated by Ripaud when he landed in Mangalore! Andronicus died in 1958. His book Eighteen Years in India was published in the Russian language in Argentina the next year. A review appeared in the Bulletin of the Russian Student Christian Movement, praising his selflessness, elevating him as an outstanding evangelist, talked about the lonely heroism of his mission, and celebrated his memoir a special example in the literature of exile. Others familiar with his work in India pointed out that his mission was essentially a failure, as he had been unable to convert the heathens to the faith, and did not establish his own church community either. The reason, of course, was that the Orthodox church of South India, while not in communion with the Russian Orthodox, was close enough to the latter in faith and spirit. And so after much deliberation, Andronicus concluded he should help the Syrian Orthodox church and not establish a separate congregation. Mirza Ghalib, though he was born in Agra, lived most of his life in Delhi—invariably in rented accommodation around the area of Ballimaran. The house where he spent his last days is in Gali Qasim Jaan (named after an 18th century nobleman, originally from Central Asia; Ghalib’s wife was a descendant of Qasim Jaan’s). Today, after having been neglected for many years, a portion of Ghalib’s haveli has been converted into a Ghalib museum, with information about his life, excerpts from his poetry, and artefacts recreating Ghalib’s days. Ancient Indians used logic and had the capacity to categorize and analyse knowledge. Thus, Panini could work on Sanskrit grammar in a way that is understandable to linguistic experts even today. Or Vatsyayan could work on the theme of sexuality, that can be understood scientifically even today. Even esoteric subjects like meditation, yoga and the nature of human soul, were looked at in logical terms, analysed and discussed. Then, why those ancient Indians, did not use that kind of logic for writing history? Why did they make a mish-mash of actual events with mythological stories? Perhaps for ancient Indians, the worlds of gods and spirits were as real as their daily physical world, because that was the only way they could make a sense out of the events? Thus their ideas of history were impossible to separate from these fantasy worlds? Perhaps it had something to do with Indian concept of time as being cyclical (and not linear), where worlds were created and destroyed in cycles,and thus history was understood differently? Saptarshi Dutta writes in WSJ India about a Mughal Art collection which depicts life before the British arrived. The post has few paintings from that collection. Five hundred years earlier, Orissa was ruled by a Hindu raja. Orissa was a Shaivite state – the God Shiva was supposed to be its lord, and the kingdom was dotted with grandly ornamented Shiva temples. One particularly magnificent sculpture – of Shiva and Parvati – likely stood at the entrance to one of the great temples. It found its way to Stuart and thence to the British Museum. This was a life-size sculpture, and originally would have been brightly painted. Shiva would have been white, signifying the ash with which the ascetic God adorned himself, with a blue throat, from the poison he swallowed during the churning of the ocean for amrit. Observe the tenderness and devotion between him and his consort – this was no impersonal deity thundering abstinence and damnation upon his followers. Ganesha, their son, appears at the bottom, while figures representing the donor of the sculpture and his wife appear to the left and right of the Gods. Jai Virdi writes about Dr. Anandi Gopal Joshi, a Brahmin, who went to United States in the 1880s to study medicine. Born in 1865 in Kaylan, a small town near Bombay (Mumbai), she was married off at 9 years old to 229 year old postmaster Gopalro (Gopal Vinayak Joshi), a widower. Gopal renamed Joshi, shifting her birth name from Yamuna to Anandi (“the happy one”). He was also a supporter of women’s education and started teaching his young wife shortly after they got married. She eventually learned Sanskrit and English. The marriage completely ideal; there’s sources indicating that Gopal often abused his young wife in order to keep her focused on her education. In the 1880s, with the help of a Philadelphia missionary, Joshi was sent to the United States to receive an education in medicine, a decision made after the tragic death of her son when she was 14. She enrolled in the Women’s Medical College of Pennsylvania, then the first hospital for women; her thesis was titled Obstetrics among Aryan Hindoos. The rediscovered Selden map shows Calicut in what would be Rangoon. Maddy explains the story behind the map. The map itself was constructed towards the end of the Ming period, i.e. early 1600’s. Calicut though still important had slipped out of the early prominence and the Arabian seas were mostly in the control of first the Portuguese and later the Dutch. The English were waiting to slip in at an opportune time. The Moplah, Marakkar and Arab sailors still plied the waters of the Arabian Sea and the Western powers i.e. Dutch, English and Portuguese ran their own shipping vessels through these waters carrying tons of spices and other goods back and forth to red sea ports. The Ming Chinese voyages had ceased in the 15th century, a full 100 years or more before the Selden map was created. The junk trade was mostly restricted to the SE Asian areas (the area depicted in the map). So why place Gu Li at the corner or even mention it? It is not possible to discuss this topic without covering the Chinese trade with Malabar through the ages, albeit briefly. If you have any links that are to be featured, please send them by any of these channels. The next carnival will be up on April 15th. Early Tibet has the history of Bodhicaryāvatāra or “Way of the Bodhisattva”, which is one of the most read texts in Tibetan Buddhist tradition. Indian Classical music has its origins attributed to Vedic times and also celestial beings like Narada, but the form familiar today was originally popularized during the 13th and 14th centuries by Purandaradasa (the pitamaha or grandsire), Bhadrachalam Ramadasa and Kshetrayya in the Kannada rajya while a senior contemporary Annamacharya also composed and sang his songs in praise of the Tirumala Lords. The most luminous of the composers and originators of the Carnatic style of music was Pundarika Vittala. The Haridasa bhakti tradition popularized songs sung in praise the celestial and Purandaradasa codified and consolidated it by evolving several graded steps such as sarali, jantai, thattu varisai, alankara and geetham. BibliOdyssey has images of 19 Deccani paintings compiled in the 19th century CE. These were called the ragamala series since it is a visualization of a musical note or melody. The British Library has an exhibit of manuscripts from Indonesia, Thailand and Burma. The highlight of the one from Burma is an illustration of the Ramayana. It was created at the royal court, where a team of painters served. 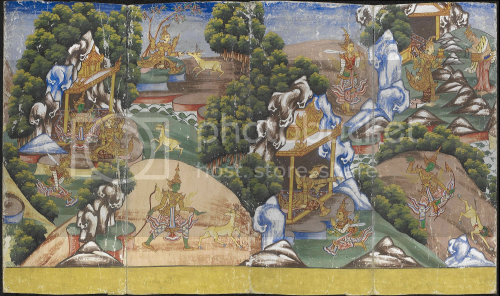 The paper of this 19th century Burmese folding book of the Ramayana was handmade from mulberry bark. 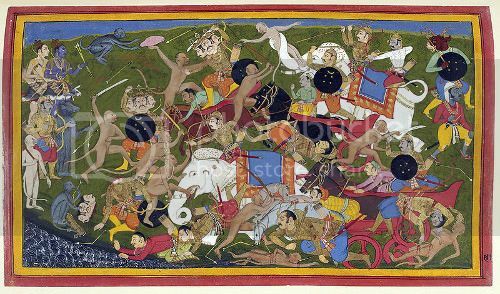 Shown here is the famous scene where Rama is lured away to shoot the golden deer. Meanwhile, his wife Sita is captured by Ravana in the guise of an old hermit, after which he returns to his original form of a fearful ten-headed giant. Dramatic performances of the Ramayana emerged in the Konbaung Period (1752-1885). The king’s minister Myawaddy Mingyi U Sa converted the Ramayana Jataka into a Burmese classical drama and he also composed accompanying music and songs. Ever since, Ramayana performances have been very popular in Burmese culture. If you have any links that are to be featured, please send them by any of these channels. The next carnival will be up on Mar 15th. 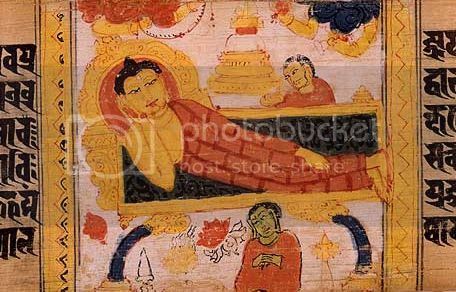 Painting of the parinirvana of Gautama Buddha. Sanskrit Astasahasrika Prajnaparamita Sutra manuscript written in the Ranjana script. Nalanda, Bihar, India. Circa 700-1100 CE. Having spent time in the real world, interacting with real scholars, I know the real situation, which is that the AIT is still taught from all the important platforms. People who tell you diferently, live in a fantasy world and only interact with village bumpkins who accept their word for it; so as feedback they ultimately only hear their own opinions. Fortunately, we can ignore recent history including these Hindu will-o-the-wisps, and start work on the really available testimonies to ancient history. GeoCurrents has the third part of the series of posts on the Vexatious History of Indo-European Studies. The latest one has a section on how it is dealt in India. Meanwhile, the legacy of Müller and his peers have came under increasing attack from another quarter altogether, that of Indian nationalism. This school is epitomized in D. N. Tripathi’s edited collection of 2005 entitled A Discourse on Indo-European Languages and Cultures. The various contributors to this volume understandably object to the old narrative of the Aryan invasion of the sub-continent, a story that emerged in the 19th century from a combination of philological inquiry and racial science. According to this account, superior Aryans invaded South Asia in the Bronze Age, conquering and ruling over the indigenous dark-skinned people and then creating the caste system to ensure that the two groups remained distinct and unequal. Support for this theory was supposedly found in the Rigveda, one of humankind’s oldest text. Yet as Trautmann shows, this neat and simplistic narrative of Aryan invasion had actually been opposed by most of the leading European Sanskritologists of the 19th century. It has also been rejected by modern mainstream scholars, who deny stark racial divisions and tend to posit plodding infiltrations of Indo-European speakers into the Indian subcontinent, along with a gradual and complex development of caste ideology. And regardless of the seemingly clear division of South Asia into an Indo-European north and Dravidian south, it has long been recognized that the entire region shares numerous linguistic features, making it a Sprachbund or linguistic convergence zone. A while back I did a post on the origins of Aviyal. Maddy writes that in Travancore it was also known as Ramayyar kootu and has a post on Ramayyan Dalawa, who was Chanakya and Shakuni rolled into one. If you were to study the successful reign of Marthanda Varma, you will quickly notice that there was one person who faithfully tended to him and guided him through those hectic days. In fact that person had been around even before MV took the throne, rightly or wrongly, from his uncle Rama Varma. The shrewd man was not only a Shakuni and Chanakya rolled in one, but also a very able administrator. Krishnan Raman or Ramayyan, that was his name, of Tamil Brahmin stock, was a good cook and a person of stern behavior, great logical outlook and acute intellect. Well, if you were to look at his story, you would be surprised at the involvement he had with the illustrious king, and not only that but you will also come across a large number of anecdotes attributed to him and retold even today. He is also considered to be the inventor of the Malayali dish Aviyal or what is sometimes termed as Ramayyar kootu in Travancore. That’s the 6th anniversary of the carnival. If you have any links that are to be featured, please send them by any of these channels. The next carnival will be up on Feb 15th.